Sorry for the delay in posting new things! My daughter is doing great after her wisdom teeth were removed, but we did have a few rough days. Getting back to our routine now... here is some frugal crafty goodness! 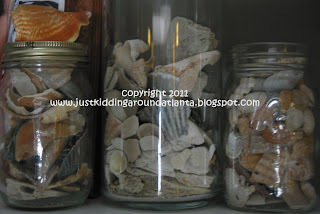 So, we arrived home from our beach getaway with SO MANY SHELLS! The kids each found bags of them, and I did too! 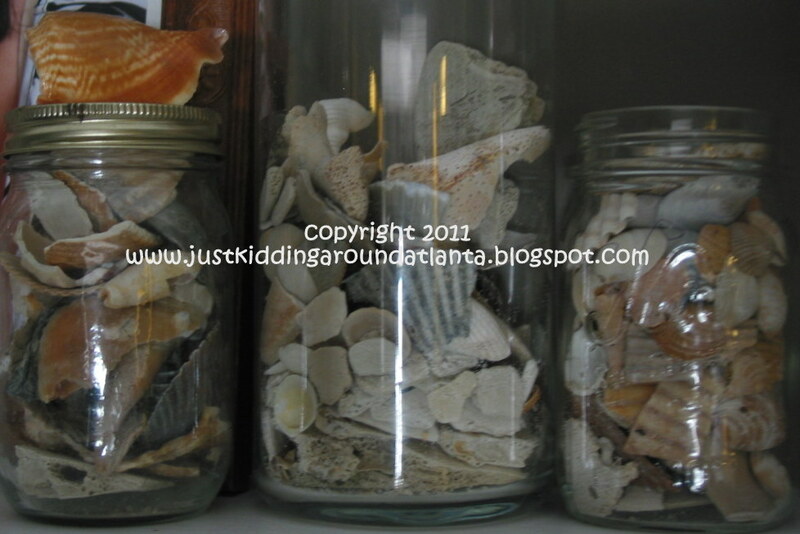 This is just a small selection of the shells we brought home!! When we arrived home, I boiled them on the stove with a little bleach to kill any nasty germs that might have hitched a ride with them. Then we spent a few days letting them dry out again. So I decided to go that route. Simple but elegant, showcasing the nooks & crannies of each shell with the gorgeous paint. I followed her directions and looked for Krylon Chrome spray paint (she tested a few colors & found this to be the perfect color). David & I hit up two stores on Sunday morning before we finally found that color, but it was Rust-o-leum brand. (worked just fine, btw!) Once home, David & I sorted the shells to find the ones we were willing to paint from our stash. 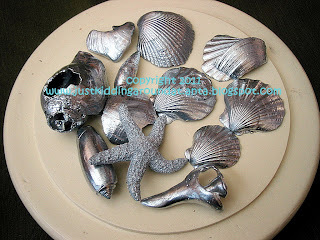 (We're still planning a dollar store trip to get some more shells exclusively to paint!) 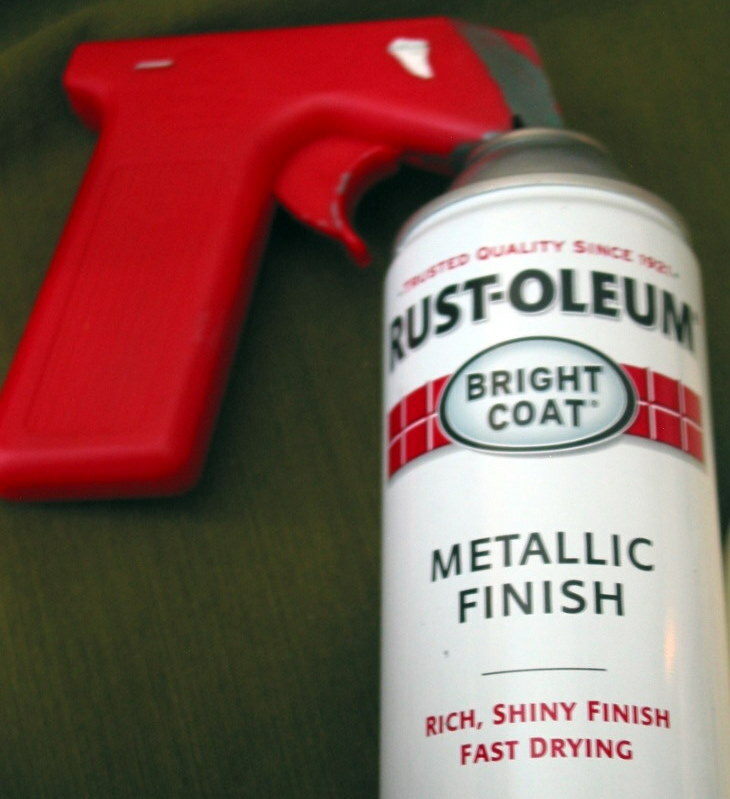 (ps ~ if you don't have a handle/sprayer thingie for your spray paint, you need to run get one - it makes it so much easier to get an even coat on anything you spray paint, and no more painted fingertips! I got mine for under $3 on Amazon.com) Here is the first batch of shells ~ I spraypainted each side, with about 15 minutes drying time, then turned them over and sprayed again! Look for imperfect shells when you are choosing your shells to paint (those with barnacles, holes, etc), they look so cool painted! Aren't they lovely? I want to get more Starfish (and a couple sand dollars & sea biscuits) from Michael's to paint - LOVE how the textures really show up with the coat of paint! It's not as shiny as the shells because the starfish is so porous, but I really love the final result. Right now they are hanging out inside one of my made-over Goodwill cheese domes - this one is painted Antique White. I tried taking a picture of these under the glass, but it didn't cooperate, so here ya' go!! A few of these are destined to become pins or rings, too. They are just too pretty to keep on display - they need to be worn and admired! : ) I'll post pics from that project soon, too!